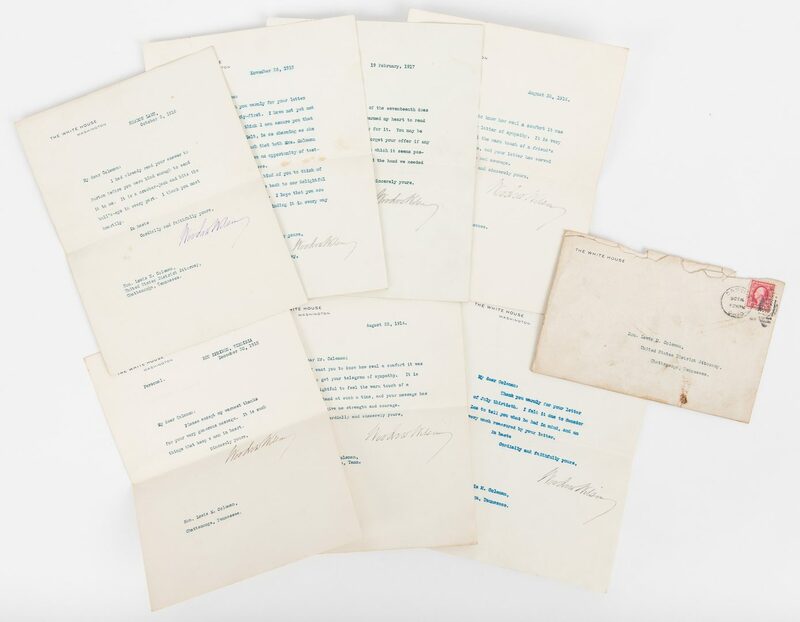 Seven (7) Woodrow Wilson TLS, written as the 28th President of the United States of America, dated 1913-1917. 1st item: TLS. One page typed bifolium. From President Woodrow Wilson, The White House, Washington, D.C., to Hon. Lewis M. Coleman, United States District Attorney, Chattanooga, TN, dated August 4, 1913. The letter reads "My dear Coleman: Thank you warmly for your letter of July thirteenth. I felt it due to Senator Lea to tell you what he had in mind, and am very much reassured by your letter. In haste Cordially and faithfully yours, Woodrow Wilson". 9" H x 7 1/8" W. Note: Luke Lea (1879-1945) was a Democratic United States Senator from Tennessee from 1911 to 1917. He was the publisher of The Tennessean. 2nd-3rd items: Two (2) TLS. One page typed bifolium. 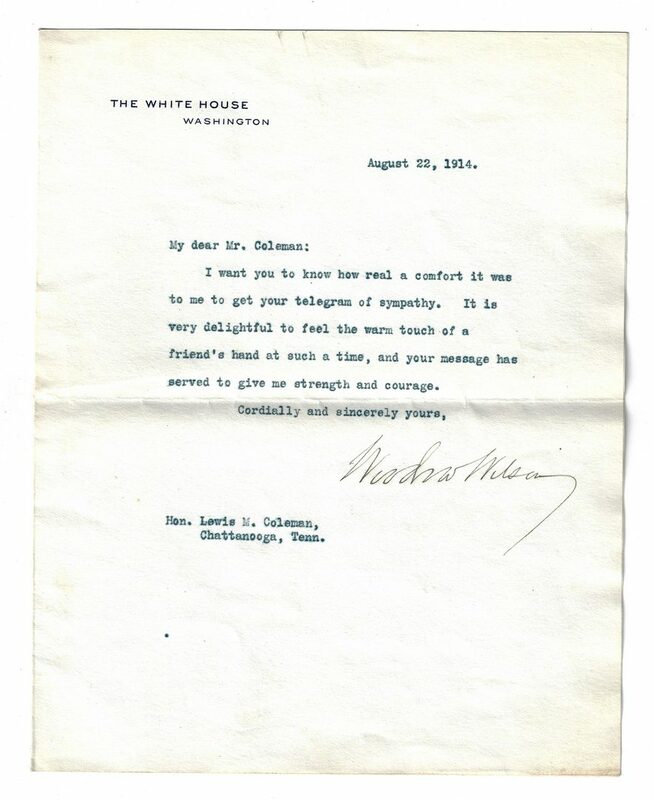 From President Woodrow Wilson, The White House, Washington, D.C., to Lewis M. Coleman, Chattanooga, TN, dated August 22 and 24, 1914. The letters discuss the illness of Wilson's first wife Ellen Louise Axson Wilson (1860-1914), reading "My dear Coleman: I want you to know how real a comfort it was to me to get your [letter/telegram] of sympathy. It is very delightful to feel the warm touch of a friend's hand at such a time, and your letter has served to give me strength and courage. Cordially and sincerely yours, Woodrow Wilson". Includes one White House stationary envelope, with two black postmark stamps, one from Canton, Ohio, dated Oct 4, one illegible with 1915 below, and red two cent Washington stamp. 9" H x 7 1/8" W. 4th item: TLS. One page typed bifolium. 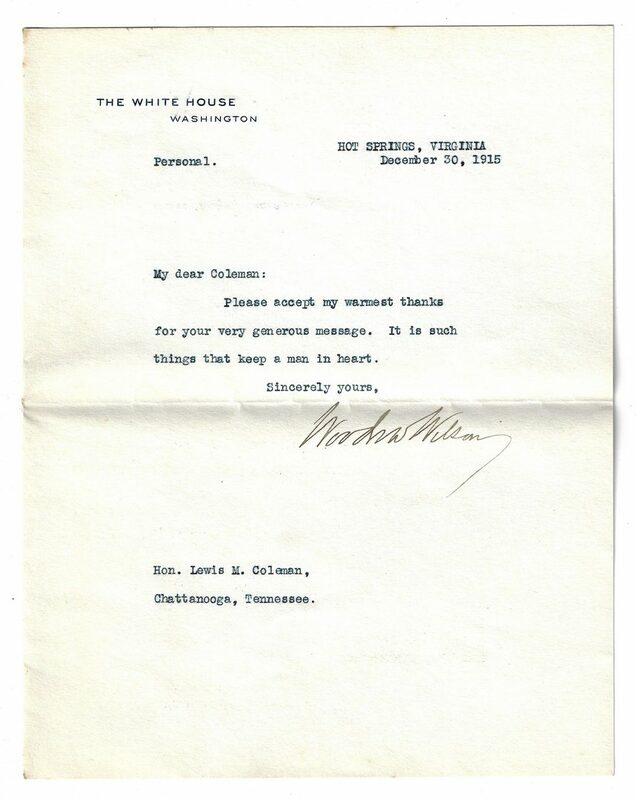 From President Woodrow Wilson, The White House, Washington, D.C., to Lewis M. Coleman, Chattanooga, TN, dated November 26, 1915. The letter discusses Mrs. H. H. Maury of Anniston, AL, the sister of his Wilson's soon-to-be wife Edith Bolling Galt. Wilson writes "My dear Coleman: Thank you warmly for your letter of November twenty-first. I have not yet met Mrs. Maury but I think I can assure you that her sister, Mrs. Galt, is as charming as she is. I hope very much that both Mrs. Coleman and you may soon have an opportunity of testing that for yourselves. It was very kind of you to think of me. My mind often goes back to our delightful association in Virginia. I hope that you are enjoying your work and finding it in every way satisfactory. Always Faithfully yours, Woodrow Wilson". 9" H x 7 1/4" W. Note: Wilson married Galt on December 18, 1915, at her home in Washington, D.C. William Gibbs McAdoo (1863-1941), 46th United States Secretary of the Treasury and Wilson's son-in-law, was a witness. 5th item: TLS. One page typed bifolium. 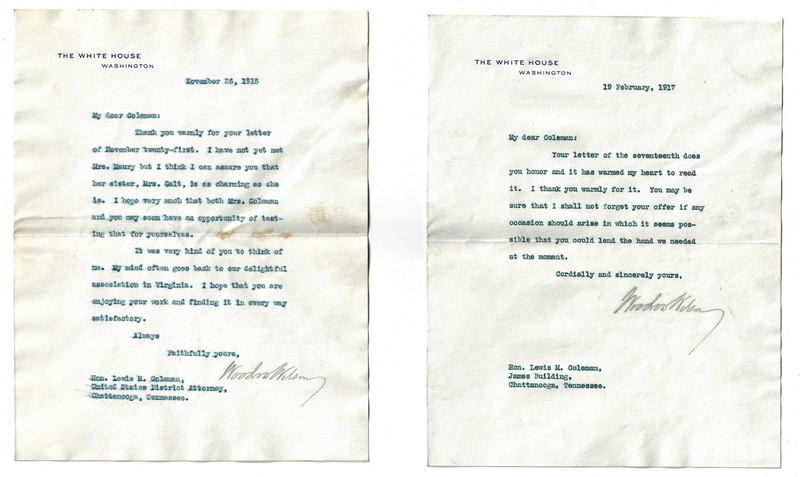 From President Woodrow Wilson, The White House, Washington, D.C., to Lewis M. Coleman, Chattanooga, TN, dated December 30, 1915. The one page folded letter, typed on White House stationary, with Hot Springs, Virginia address and marked Personal, was written during Wilson and Edith Bolling Galt's honeymoon and reads "My dear Coleman: Please accept my warmest thanks for your generous message. It is such things that keep a man in heart. Sincerely yours, Woodrow Wilson". 9" H x 7 1/8" W. 6th item: TLS. One page typed bifolium. 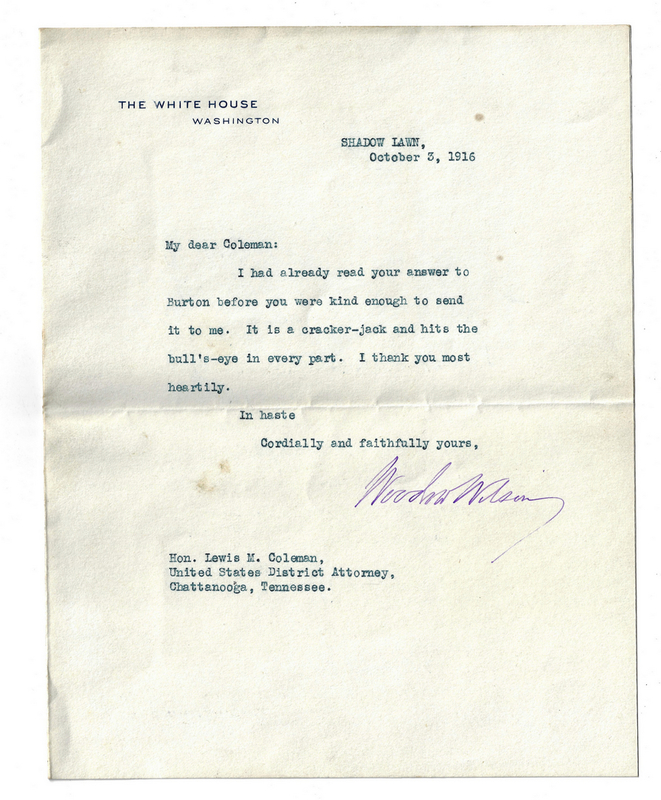 From President Woodrow Wilson, The White House, Shadow Lawn, Virginia Beach , to Lewis M. Coleman, Chattanooga, TN, dated October 3, 1916. The letter reads "My dear Coleman: I had already read your answer to Burton before you were kind enough to send it to me. It is a cracker-jack and hits the bull's-eye in every part. I thank you most heartily. In haste Cordially and faithfully yours, Woodrow Wilson". 9" H x 7 1/8" W. 7th item: TLS. One page typed bifolium. 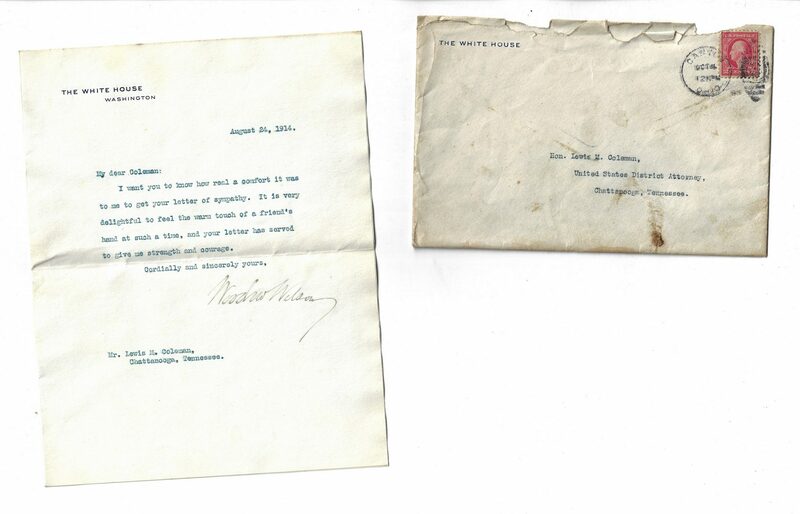 From President Woodrow Wilson, The White House, Washington, D.C., to Lewis M. Coleman, Chattanooga, TN, dated February 19, 1917. 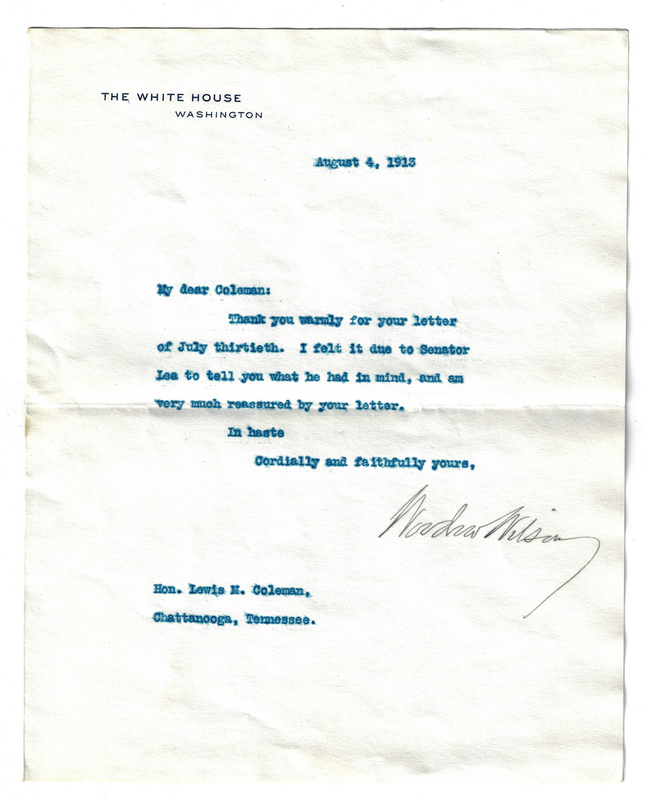 Written during the months leading to the entry of the United States in World War I, Wilson writes "My dear Coleman: Your letter of the seventeenth does you honor and it has warmed my heart to read it. I thank you warmly for it. You may be sure that I shall not forget your offer if any occasion should arose in which it seems possible that you could lend the hand we needed at the moment. Cordially and sincerely yours, Woodrow Wilson". 9" H x 7 1/8" W. Provenance: The Estate of Charles Boyd Coleman, Jr., Chattanooga, TN, by descent from Lewis M. Coleman (1861-1918, U.S. District Attorney, Chattanooga), son of CSA Lt. Colonel Lewis Minor Coleman (1827-1863) and Mary Ambler Marshall, daughter of James K. Marshall and granddaughter of U.S. Chief Justice John Marshall (1755-1835). Lewis M. Coleman Jr. also was related to the family of Henry Dearborn by his marriage to Julia Wingate Boyd, daughter of Annette Maria Dearborn Boyd, great granddaughter of Gen. Henry Dearborn (1751-1829) on her mother's side. CONDITION: 1st item: Overall good condition. Wilson signature strong, clear condition. Blue ink slightly smudged but legible. 2nd-3rd items: Overall good condition. Wilson signatures strong, clear condition. Traces of rust from paper clip, top center, with two minute areas of dampstaining, visible en verso of August 22 letter. Envelope with stains, tears, etc. to be expected from age and manner of use. Envelope might not be original to letter but was found with it. 4th item: Overall good condition. Wilson signature strong, clear condition. 1/2" x 1/2" brown stain, areas of dampstaining, largest 5/8" x 1 7/8", surface and en verso of letter (does not affect signature). Slight smudging to blue ink, transfer of ink to blank page. 5th item: Overall good condition with slight surface scuffs. Wilson signature strong, clear condition. Slight transfer of ink. 6th item: Overall good condition with minute foxing spots, brown stains, largest 1/4", surface and verso of letter. Wilson signature strong, clear condition. 7th item: Overall good condition with surface scuffs and slight waviness to letter. Wilson signature strong, clear condition. Green ink slightly smudged.